Still blushing, Saix leaned into the touch, only to have it stolen away. He watched Xemnas move away and nodded slightly, "B- Bye, Sir..."
Demyx ran into the cafe and up to Aerith behind the counter. "I-I'm sooo sorry, Aer, I was only s'posed ta take a short nap and when I woke up it was late and I ran all the way here. I'm really sorry, and I plan on makin it up to you since this is my first day and all." He pleaded to his boss a genuinely apologetic look in his eyes as well as on his face. "My uh, uniform is in the back, I'll just go put it on and wash my hands." 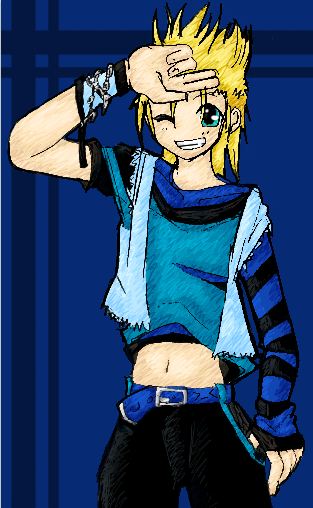 He stated a smile playing over his features before he took off and into the bathroom with his outfit. In a minute or two he was out of the bathroom and in the form fitting dress, complete with frilly hat, stockings, and heels. He picked up a pad and pencil that he’d bought yesterday just for his new job. The blond was about to go and see if there were any tables that needed a waiter but the glimpse of bright silver from his periph caught his attention. There striding in, chest puffed up with pride, (as much as one he have dressed as a french maid) also in uniform, was his Superior. “Superior?! What’re you doing here?” He asked more surprised to see Him in the place at all than in a dress. Xemnas blinked, "Did Ansem make you do this too Demyx?....Wait...." He facepalmed for the second time that day and frowned, "I've been tricked." He sighed and huffed back over to the Diviner, slamming his head on the table in an exhausted groan. "Saix....I hate my existence right now." Saix jumped slightly along with the silverwear when Xemnas slammed his head down on the table. He moved his hand to stroke through the pretty silver hair, "Why is that, Sir?" Xemnas whined lightly, "I don't even need to be wearing this, Ansem lied, I am a fool!...and Demyx is here...so that just multiples it by two." He set his head on Saix's shoulder and yawned, "but maybe it's not all so bad." He snapped his fingers and darkness engulfed his being, changing him into a much sexier butler outfit, a white overcoat (complete with the final boss design of course) and black undercoat. He turned to Saix, "Now, where did we leave off?" Demyx came bustling out from the back and to their table "Puppy~!" He exclaimed before sitting down across from the couple. "Superior who's Annie and--awww, what happened to your dress? We were so cute together now I'm all alone..." He said before straightening his frilly hat thingie and playing with his stockings. "Jeez these things are so frickin itchy~" The blonde whined as he fidgeted more in his seat. When he opened his eyes he looked at them and sat in silence a moment before smiling brightly at them. "You two sure are a cute couple Superior~!" He said giggling into his pad as he pinched Saix's cheek fondly. What kinds of freaks have I hired? she thought, slapping her forehead. She grabbed Demyx by the shirt collar and dragged him into the back room. She forced his regular clothes back into his arms. "Wear these. There is no serving uniform. Just an apron with a name tag. If I ever see you in a dress again, I swear I'll fire you." She didn't need two drag queens. The bell on the door rang and all attention was drawn to the dark figure in the doorway. "Hm. How interesting, Mother would like it here." Aerith heard the bell over the door ring and poked her head out the back. "We'll be with you in a minute!" she called, then realizing who she was talking to, dived back in the back room. "Demyx, I want you to take care of the custumer, in your normal clothes, please." She was not about to deal with Sephiroth the nut job. Let the nuts take care of him. Sephiroth looked around, "I wonder if they serve muffins", he turned abruptly, his sword knocking down everything in sight, "What a bother." He sat across from Xemnas and Saix, not really paying attention. 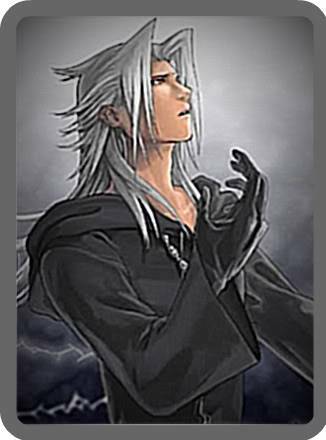 Xemnas glared at the other male, possessively moving closer to the Diviner, "do you mind?" Sephiroth turned to the two men, his mako eyes narrowing, "Are you speaking to me?" He went to draw his sword but alas, an eight-ft sword in a booth was not the best idea, he snarled, raising up a little to try to intimidate the other silverheaded man. "Y-yes ma'am. It won't happen again, ho-honest." Demyx stuttered out sheepishly. He changed his clothes once again and was back in 30 seconds flat trying his best not to anger his scary boss. She was pretty intimidating for someone so short...Tying on his apron as best he could, his pad and pencil in his mouth as he reached back to put a bow in the draw string. When he was done with that he walked over to the silver haired man sitting across from Saix-Puppy and his Superior and introduced himeself. "Hello and welcome to our cafe, my name is Demyx and I'll be your waiter for today." He stated with a smile. As he finished however, he could feel the tension that seemed to linger among the two silver haired men at the crowded booth as well as see the sword that was slighlty raised. "Uh-uhmm...sir I'm sorry to bother you but I could get you your own booth, this customer was here first and has been for a while now. If you'd please just follow me, also your ummm sword, it's really sharp and might scare customers away, so I- uhh, have to ask you to put it away...please?" Demyx was proud of himself he didn't sound as scared as he really felt. In truth this new customer seemed pretty scary and he wanted to run away as fast as he could but then he thought about those headpones he saw last week and how long it would be before he could afford them if he was fired for not serving a customer. No matter how creepy the guy was. 'Headphones. Headphones. Headphones...' Was his mantra, his motivation to keep moving forward. Aerith slapped her forehead at the mess her shop had become because of Sephiroth's blade. I guess I'll have to be out front anyway, she thought, stepping out from the back and moving to pick up the shards of glass from the broken vase and the flowers that had been in those vases until moments before. What am I worried about, anyway? she scolded herself silently. Sure, Sephiroth's psychotic, but I don't think he'll cause any trouble here, not with Demyx being in the way. She didn't particularly want Demyx to be a human sheild, but if it came down to it, he'd probably get in the way anyway. She just hoped it wouldn't come to that as she walked back to the kitchens to get together the order that would soon come. 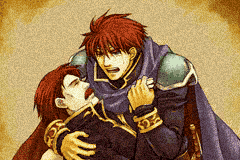 "We have so much catching up to do Hector," He said, speaking to Hector casually, though he was a great wealthly Lord, well known for his bravery in battle, "It's been quite a while. I remember when we were learning numbers in school." Well, casual was fine for the both of them, considering he himself was a prince of Pheare. "Ah, yeah it has been. After I heard of your father's death I came to your home as quickly as I could," Hector said, "To pay my respects, his death brought me to realize how often I have ignored our friendship, sorry for that. After all, I couldn't just NOT visit my red head." He laughed. Before Aerith could close the kitchen door, she noticed two customers walk into the shop. Since Demyx and Xemnas were already busy, she decided to take care of these two instead. She walked over to their table, put on her sweetest smile, and asked, "Hello, I'm Aerith, and I'll be your server today. What can I get you both?" "Well...I'm a fatty who likes food if you know what I mean. So get me whatever has the most calories!" He chimed. 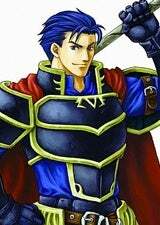 "Obvious you weren't paying attention in the nobility class where they always told you to speak politely either," Eliwood was usually easily spotted out by people, due to his red hair. Many knew him from his acts of kindness and politeness. Usually he had a lot of problems with people recongizing him, weither they knew him personally or not, especially when he was younger due to people attempting to kidnap him for ransome, "I'm actually on a diet right now...so something small like...a salad would probably be best, and thank you muchly in advance." "But your so skinny! Why do you need to be on a diet! Let loose! It's not like there's any wars going on right now!" Xemnas snarled now, raising himself to his feet, "Now listen here you son of a -"
Sephiroth ignored the silverheaded man and his apparent love-interest, he even shoved Demyx abruptly aside in order to see something...he had heard it, that voice, that awful voice, "YOU!!!!" He pointed directly at Aerith, causing everyone to get quiet, he drew his sword, which exploded into a bouquet of flowers, "Sorry for .....well you know!" He grinned insanely, "Oh that Cloud!" He handed them to her, as if nothing out-of-the-ordinary had just occurred. First, Aerith was dealing with the giant flirting man, trying her best to keep smiling despite his lewdness. Second, she had turned around suddenly to defend herself from Sephiroth's attack. The next thing she knew, there was a boquet of flowers in her face, held out to her by none other than Sephiroth. She really had no idea what to say to something like. What did one say to a psychopath giving flowers? Well, that was obvious. What they wanted to hear. "Um, thank you, Sephiroth," she said awkwardly. "They're beautiful." And they were. They were probably the most beautiful flowers she'd ever seen. She went over to a table far from Sephirtoh's long sword and put them in the unbroken vase on there. 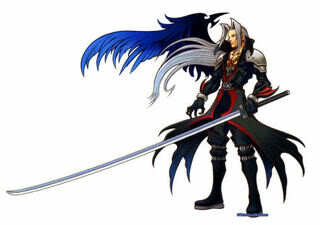 Xemnas turned to Saix, "......Back to what I was saying Saix, so, what do you think of this outfit? More suiting?" "Out delivering packages, I think," Aerith said. "Or maybe in the colliseum, fighting Ice Titan for the twelth time. Or in Radiant Garden, getting everyone's way and not helping set things up." Sephiroth was seriously making her nervous. Where was his sword? This close, there was no way he could stab her with something that long, but that didn't mean he couldn't injure her still. Saix let out a little squeak, "Can we not change the subject, Sir?" Xemnas sighed, "I'm sorry Saix, not having a heart makes flirting a bit difficult wouldn't you say? Saix shifted in his seat slightly, "Uhm, I would say so, yes, Sir. Flirting would be a difficult activity to do without emotions... though you are doing a fair job..."